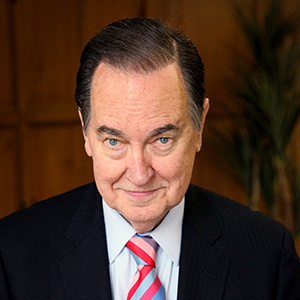 With a twice-weekly column appearing in over 500 newspapers nationwide, Cal Thomas is the most widely read and one of the most highly regarded voices on the American political scene. He is a panelist on the popular “Fox News Watch” show. A graduate of American University, Thomas is a 35-year veteran of broadcast and print journalism. He has worked for NBC, CNBC, PBS television, and the Fox News Network, where he currently provides weekly political commentary. Cal Thomas has appeared on NBC Nightly News, Nightline, The Today Show, Good Morning America, CNN’s Crossfire, Larry King Live, and the Oprah Winfrey Show. In 1995, Thomas was honored with a Cable Ace Award nomination for Best Interview Program. Other awards include a George Foster Peabody team reporting award, and awards from both the Associated Press and United Press International. A writer of force and clarity, Cal Thomas has authored eleven books including his most recent work with Bob Beckel, Common Ground: How to Stop the Partisan War that is Destroying America. He has also penned Blinded by Might: Can the Religious Right Save America?, A Freedom Dream, Public Persons and Private Lives, Book Burning, Liberals for Lunch, Occupied Territory, The Death of Ethics in America, Uncommon Sense and Things That Matter Most. Thomas and Beckel also write a twice-monthly column for USA Today. Cal Thomas and his wife, Ray, who is a family therapist, have four children and eight grandchildren and live in the Washington DC area.